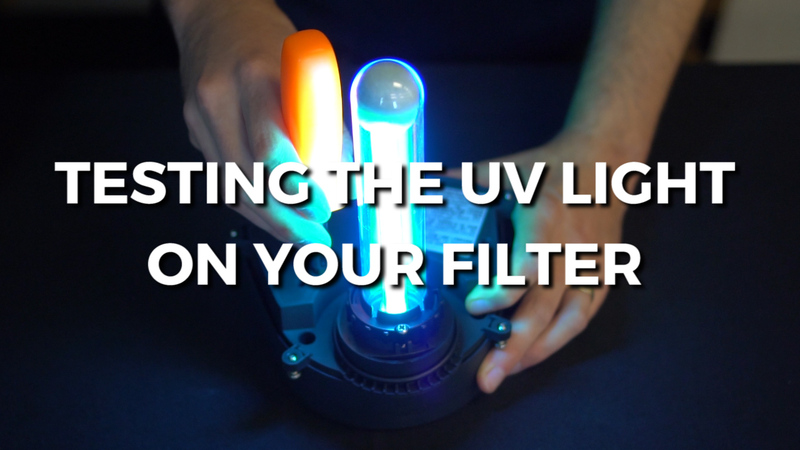 Testing the UV Light On Your Laguna Pressure-Flo Filter As a warning - you will be exposing a lit UV bulb - Do NOT look directly at the light. Use your peripheral vision. Most UV's have an indicator which shows you when the unit is functioning. Just as this unit does, but they sometimes can be difficult to see, especially during the day. And, sometimes your vision may not be as sharp as you think it is. Once, you get the transformer head off the filter, go ahead and turn it upside down. As, you can see the transformer is plugged in and the bulb is not lit. This is due to factory installed safety switch which prevents the bulb from lighting if the unit is not fully assembled. But, we can manually engage this switch. This is going to be a fool proof method of testing. As a warning – you will be exposing a lit UV bulb – Do NOT look directly at the light. Use your peripheral vision. First, locate the two holes close in proximity – the larger has the safety switch installed. Take a small screwdriver or similar tool and gently slide it in until you hit the bottom, keep pushing until you hear a click. And, the bulb will engage. For additional questions on this process, please don’t hesitate to call, I’m Joe from webbsonline.